Group portrait of the Non-commissioned Officers of the 6th Field Company of Australian Engineers. 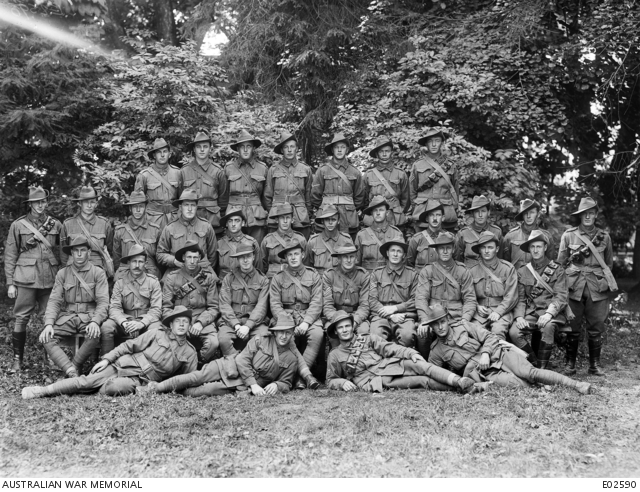 Back row, left to right: 3344 Sergeant (Sgt) W. Gough DCM; 7765 Sergeant (Sgt) R. J. Jones MM; 3384 Lance Corporal (L Cpl) C. J. Hughes; 7007 L Cpl A. Tarrant; 3314 Second Corporal (2nd Cpl) R. T. Lack; 8101 2nd Cpl S. J. Currant; 3421 L Cpl J. Baillie. Third row: 8183 Corporal (Cpl) P. Armstrong MM; 3468 L Cpl R. J. White; 3448 L Cpl C. L. Garden; 757 Cpl A. S. Chapman; 3395 L Cpl L. G. Poole; 3365 Cpl F. Waugh; 3441 Cpl J. J. Stonehouse MM; 3472 Farrier Sergeant A. W. Haygarth; 3281 Sgt G. Patrick MSM; 4525 Company Sergeant Major R. Brownlee; 3284 Company Quartermaster Sergeant T. C. Ayers; 3454 Sgt T. Williams. First row: 3348 2nd Cpl E. J. Jennings MM; 7000 L Cpl C. J. Wright; 3810 L Cpl J. Firth; 16949 L Cpl J. L. Aitken; 3403 L Cpl E. R. Watson; 5598 Cpl H. W. H. Godwin; 3306 L Cpl J. Doody; 3116 Cpl D. A. Sievers; 3815 L Cpl D. T. Murphy; 771 L Cpl W. Worland MM. Front row: 6734 L Cpl G. M. Picken; 8251 L Cpl W. C. Smith; 3498 L Cpl E. W. Stoddart; 7309 L Cpl N. Thomson MM.